Mrs. C.B. 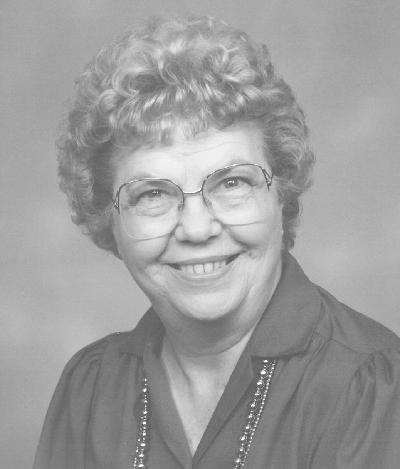 (Lois McKee) Campbell passed away on Sunday, May 24, 2015 in Abilene. Graveside services will be 11:00a.m., Friday, May 29, 2015 in the Abilene Municipal Cemetery under the direction of Elliott-Hamil Funeral Home, 542 Hickory St. Visitation will be Thursday evening, May 28, 2015 from 6:00p.m. - 8:00p.m. at the funeral home. Lois was born on September 22, 1922 in Ovalo, Texas to the late J.C. and Lucy May Ferguson McKee. She graduated from Ovalo High School in 1940 and married C.B. "Bill" Campbell on November 16, 1942 in Ovalo, Texas. Lois furthered her education by attending and graduating from Hardin Simmons University. She was a teacher for the Tye and Groom Independent School districts, teaching primary grades for 20 years before retiring in 1984. Lois was a lifetime member of Texas State Teachers Association as well as being a member of other associations such as Hendrick Volunteer Auxiliary, Abilene Retired Teachers Association, Texas Retired Teachers Association, and the Retired and Senior Volunteer Programs of Abilene. Preceding her in death were her parents; her husband, C.B. "Bill" Campbell(2006); a son, Bradford Campbell(1985); a daughter, Annette Campbell(2000); grandson, Brad Campbell(1984); daughter-in-law, Marsha Perritt Campbell(2003); sister, Margaret McKee Nelson(2007); and a brother, J.C. McKee, Jr.(2013). Survivors include her two grandchildren, Katy Campbell Lawler and husband, Devin and Chris Campbell all of San Angelo; great-grandson, Zaden Jacob Lawler; her niece, Rebecca Rivera of New Mexico; nephew, Billy McKee and wife, Joanne of Abilene; and a close friend, Vonda Jackson of Abilene. You may view and sign the guestbook at www.elliotthamilfuneralhome.com.